This quilt is super easy to make. The difficult part is explaining how to put it together. 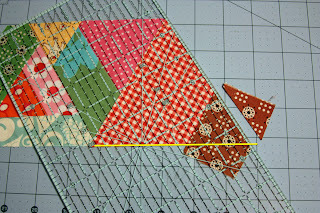 I'm using lots of scraps, anywhere from (and this is a guess) 1" strips to 5" strips, or chunks of leftover fabric. All the units are different, and I haven't made two the same size yet. There isn't a pattern -- it's one of those make-it-up-as-you-go quilts. 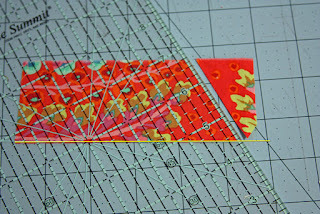 I'll show you how I piece a block, then show you some different ways to fill in areas. Once you know how it works, you can just sew like crazy. 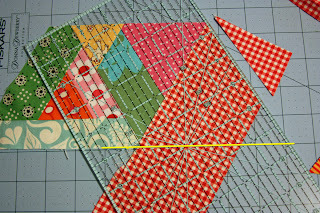 I'll show you how to put the quilt together in a later post. (Mine is still in pieces on the wall.) 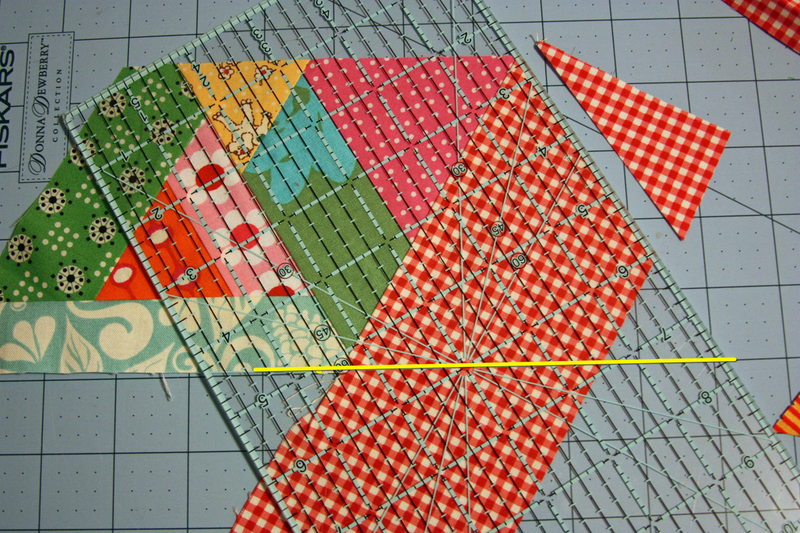 The important thing to remember is that every seam is a 60-degree angle. 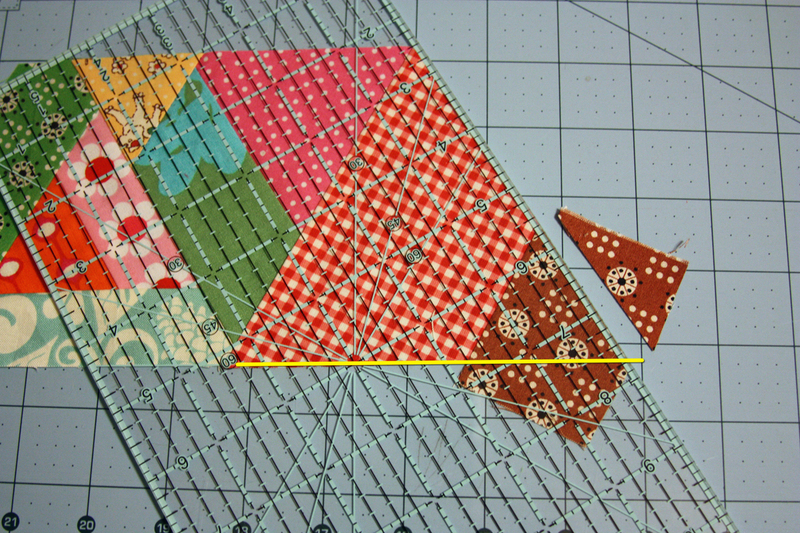 Another important thing to remember is that, when you use a strip of fabric, it should be a consistent width, i.e., if your strip is 2" wide on one end, and 3" wide on the other end, you won't maintain the 60-degree angle throughout the quilt. 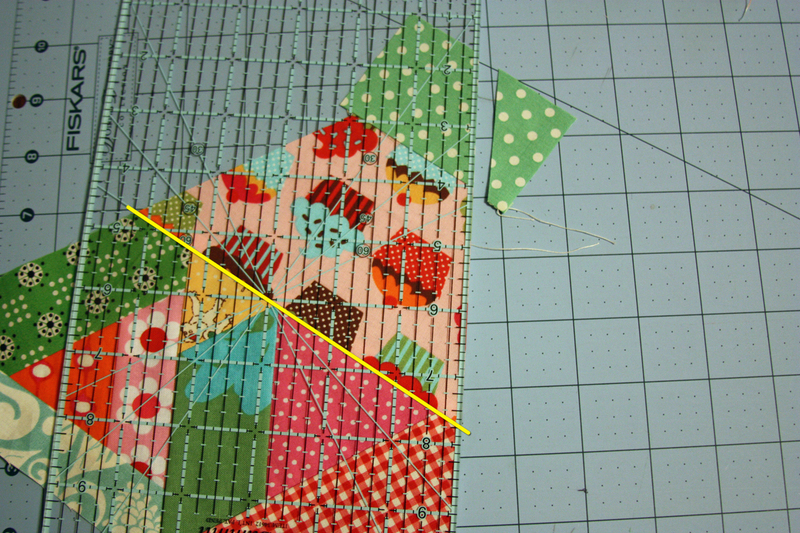 You can sew with a wonky strip, but you'll need to trim it afterwards. You'll need a ruler with a 60-degree line marking. My ruler has two markings that go in opposite directions. I'm using a 12" x 6" ruler, and sometimes a 24" x 6" ruler. 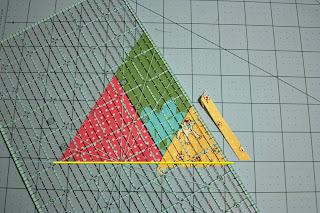 A 60-degree triangle ruler comes in handy for cutting triangles, but it isn't necessary. Even though you can use triangles to build your blocks, this isn't really a triangle quilt. 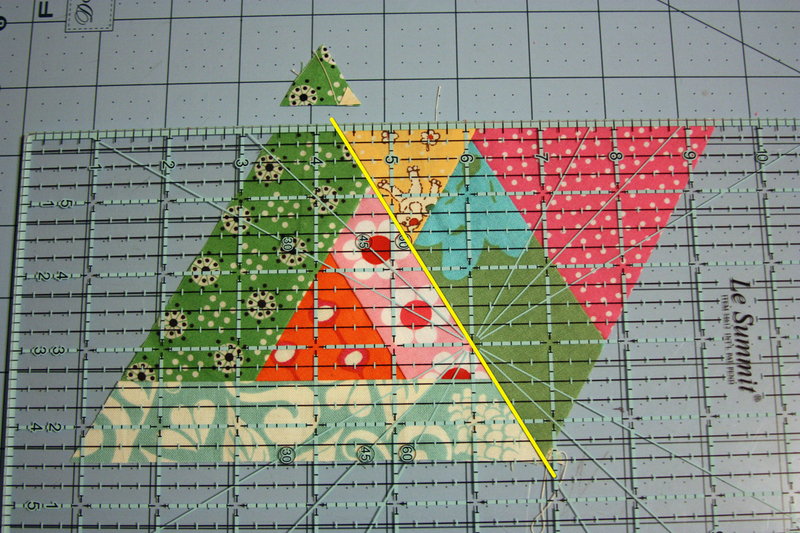 I sew random pieces together, then trim, and most of the triangles just appear accidentally. I don't worry about it, but if you want to know how to get a point, look for the * below. 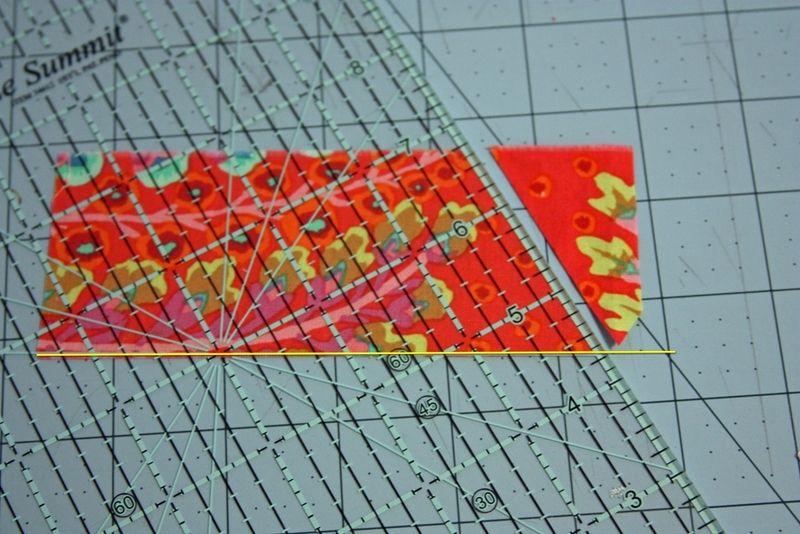 I press my scraps before sewing so that I don't have to do a lot of pressing after I sew. Because a lot of the edges are on the bias, I don't want to press any more than necessary. If you ever thought about using starch before you sew, now might be a good time to try it. The picture follows the instruction above it. I made the pictures a little smaller so the page won't take forever to load if you don't have a fast connection, but you can click on each picture to enlarge. 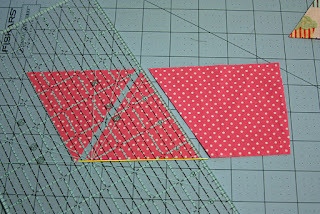 Cut A Few "Starter Pieces"
Begin by cutting a few 60-degree shapes from your strips. Not necessary, but it gives you a place to start. The size of the strips doesn't matter. Use an assortment so you'll have a variety of shapes. 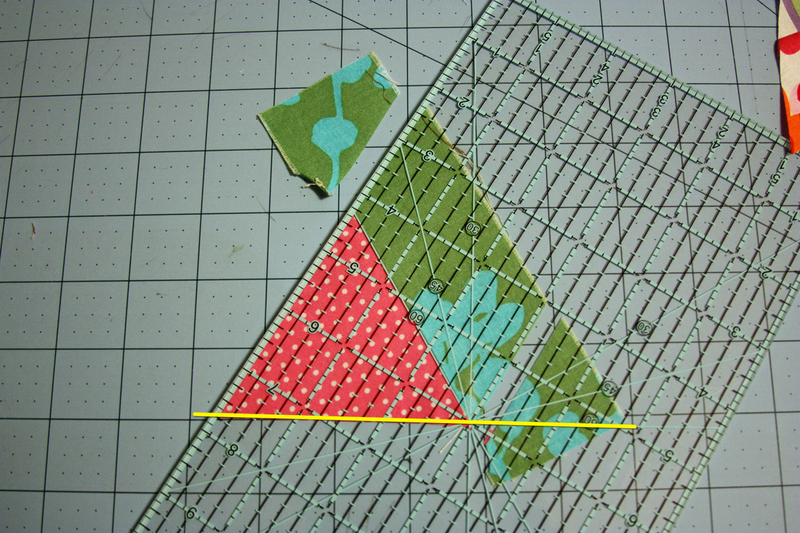 Place the 60-degree line of the ruler along the bottom edge of the strip, and the right edge of the ruler on the bottom corner of the strip. (I've highlighted the 60-degree line in yellow so you won't have to look for it.) Trim. 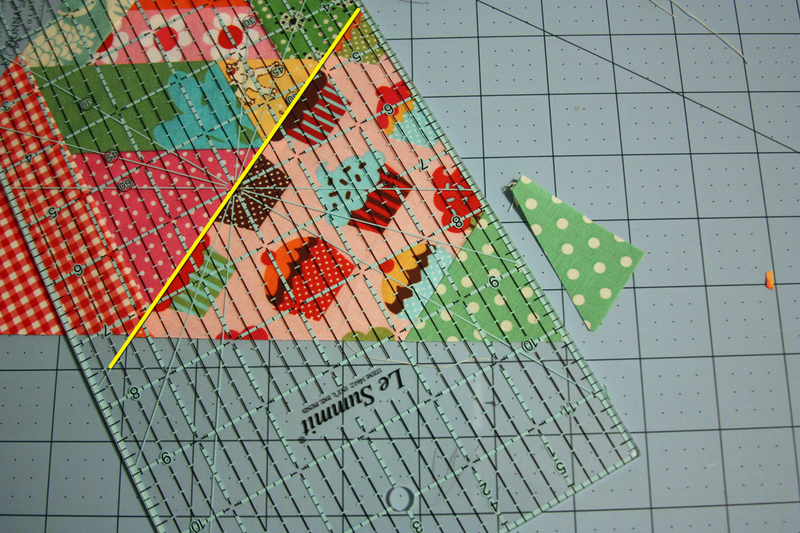 Place the 60-degree line of the ruler along the bottom edge of the strip, then trim the other side. 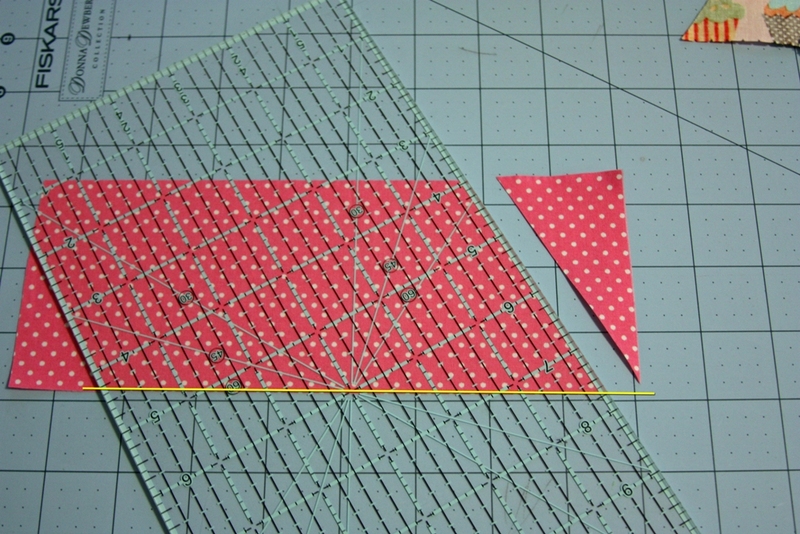 I used the whole piece of fabric for this one, but you could make two shapes if you like, or even make a diamond shape. 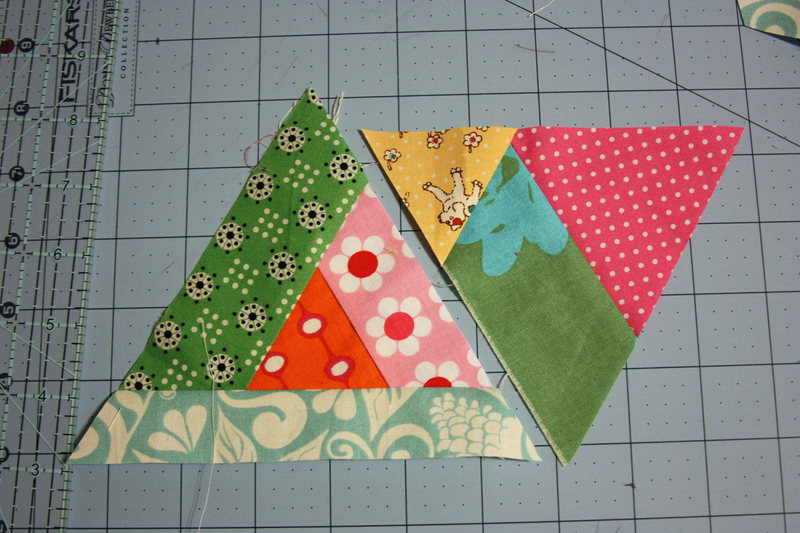 Now make a few triangles. Again, the size doesn't matter. You'll end up chopping off a lot of the points anyway. 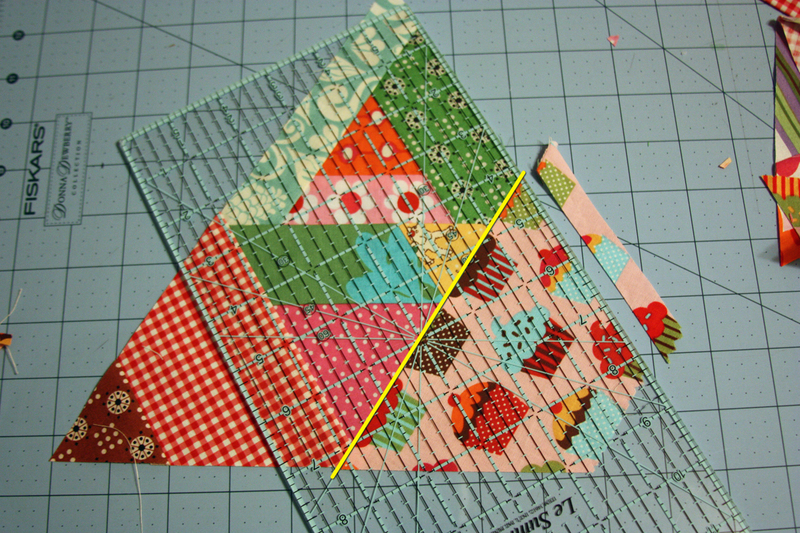 I just find it easier sometimes to use triangles rather than bigger chunks of fabric. Make lots of sizes. 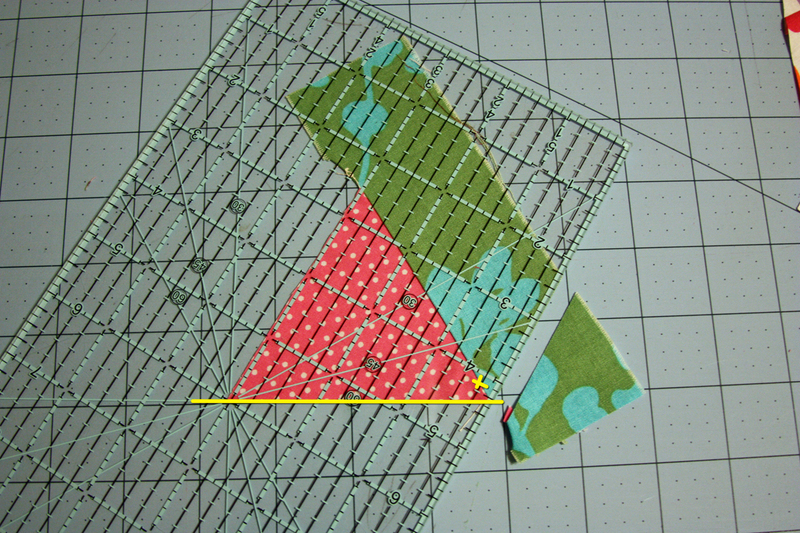 And don't worry if you chop off some points -- the 60-degree angle is what matters. 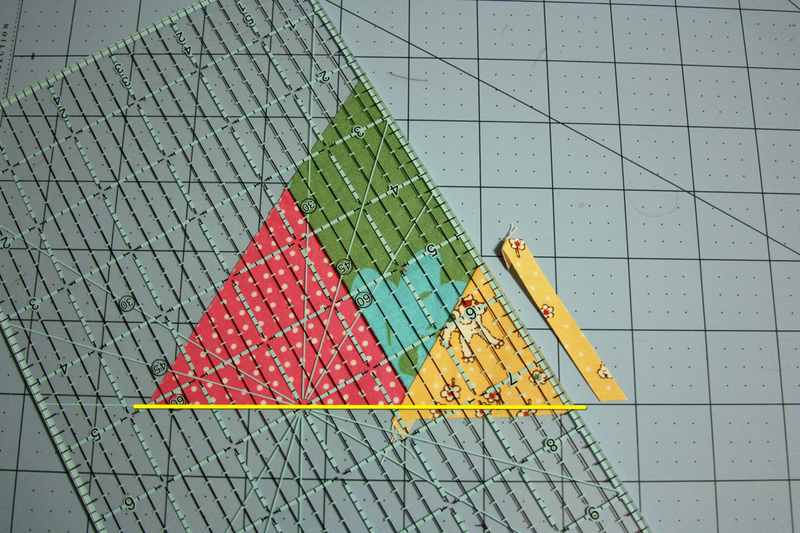 Place the 60-degree line of the ruler along the bottom edge of the strip. Trim. 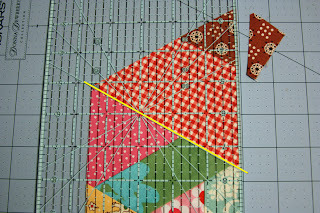 Rotate the strip so the trimmed edge is on the left. 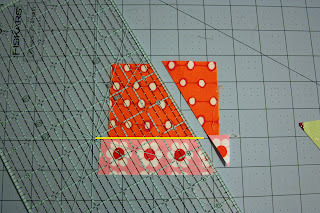 Place the 60-degree line of the ruler along the top of the strip, and the edge of the ruler at the bottom of the strip. 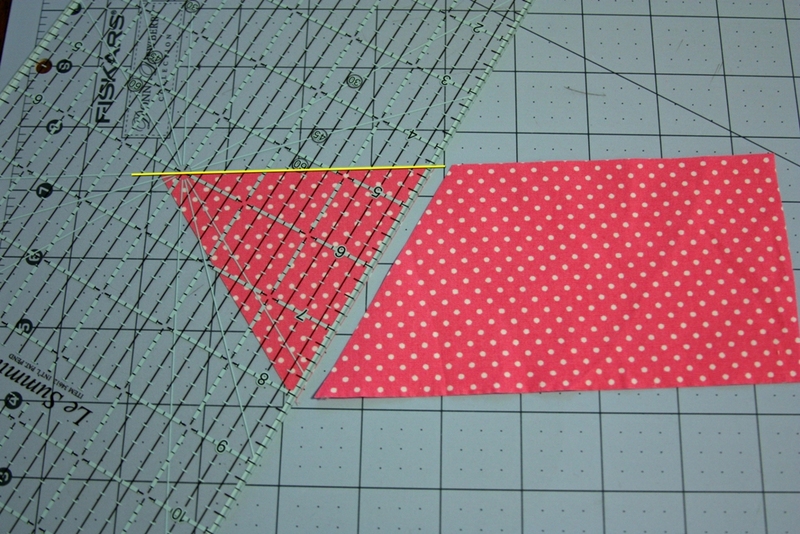 Cut to make a triangle. 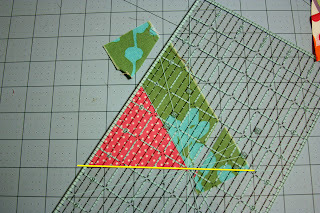 To continue cutting triangles, place the 60-degree line of the ruler along the bottom edge of the strip and the edge of the ruler at the top of the strip. 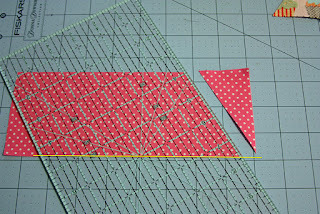 Cut to make another triangle. 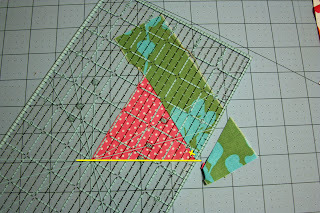 You can continue cutting triangles, or you can save the leftover piece for later -- it already has a 60-degree angle, and you'll find something to attach it to later. Here's an example of some 60-degree shapes and triangles. Let's Put Some Segments Together! Below is an example of how I might construct a unit. 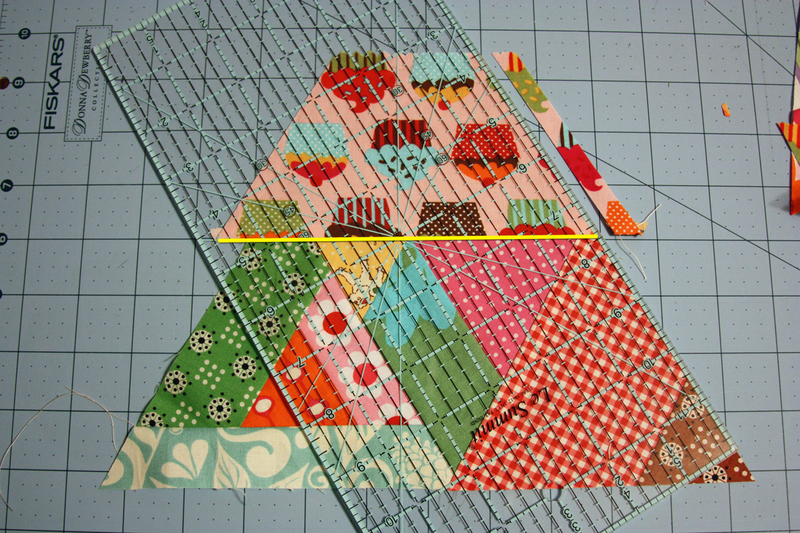 Since you'll be working with different sizes of strips, don't worry if yours doesn't look like this one. 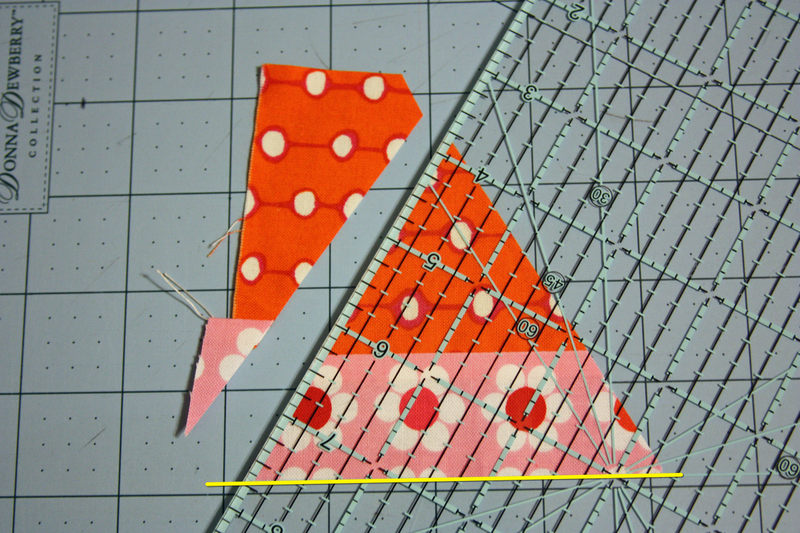 Start with one of your 60-degree shapes or a triangle, and sew a strip of fabric to it. Press in either direction. 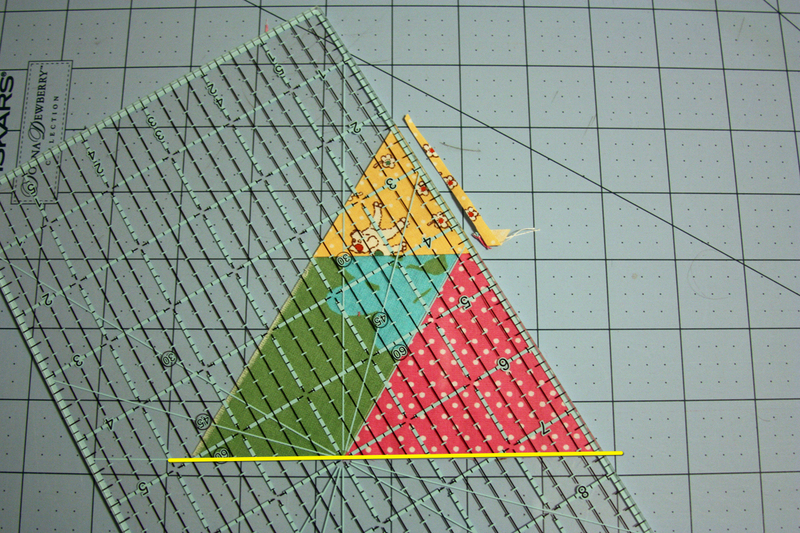 Place the 60-degree line of the ruler along the bottom of the triangle or shape. 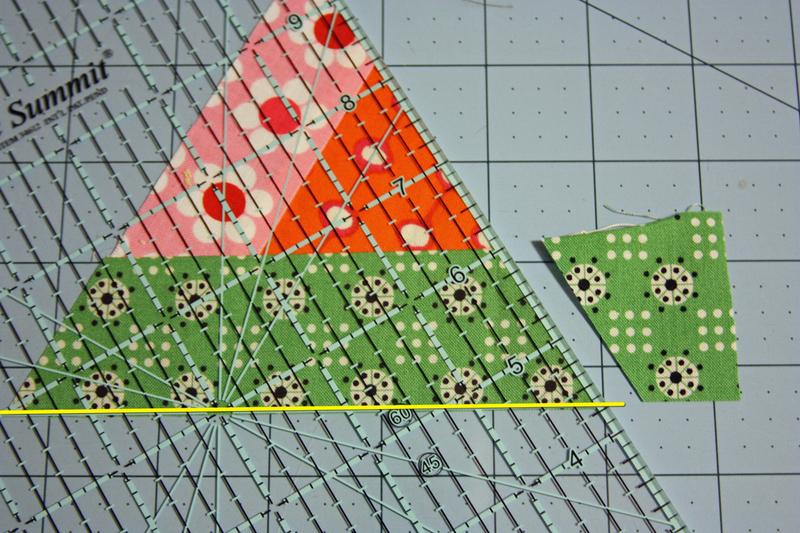 * Now I'm going for a point at the bottom of the green fabric. 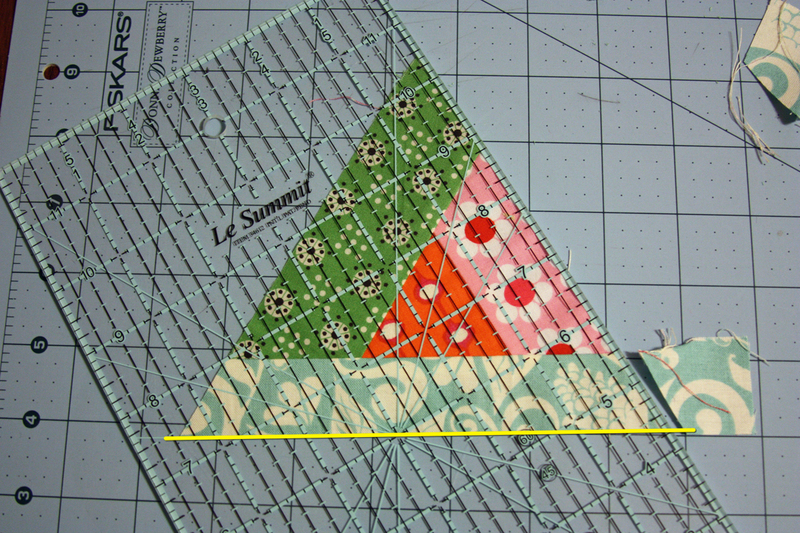 Make sure the quarter-inch line on the ruler intersects with the seam about a quarter of an inch from the bottom of the triangle. (Hope that makes sense.) 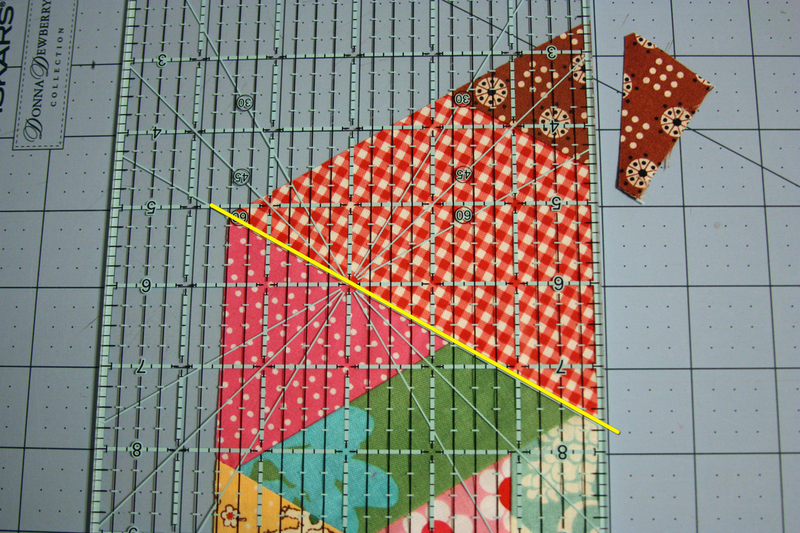 I've marked a yellow X below where the ruler marking and seam should intersect. 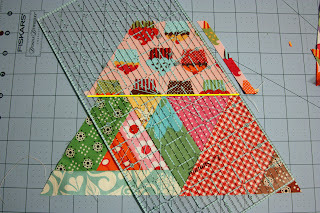 Sew a triangle or chunk of fabric to the bottom right corner. 60-degree line on the bottom; trim on the right. Rotate so the yellow triangle is on top. 60-degree line on the bottom; trim on the right. And now you have a little segement. I like to make lots of segements to combine in different ways. Let's do another one! 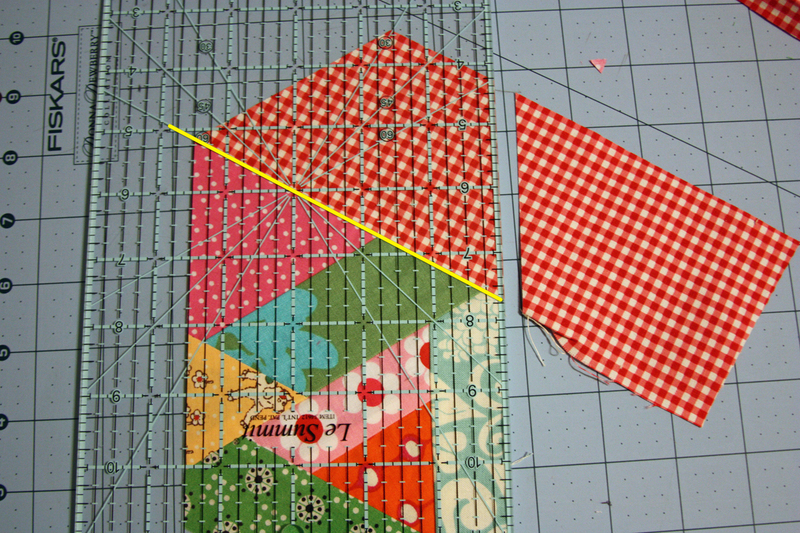 Sew a couple of rectangles together. 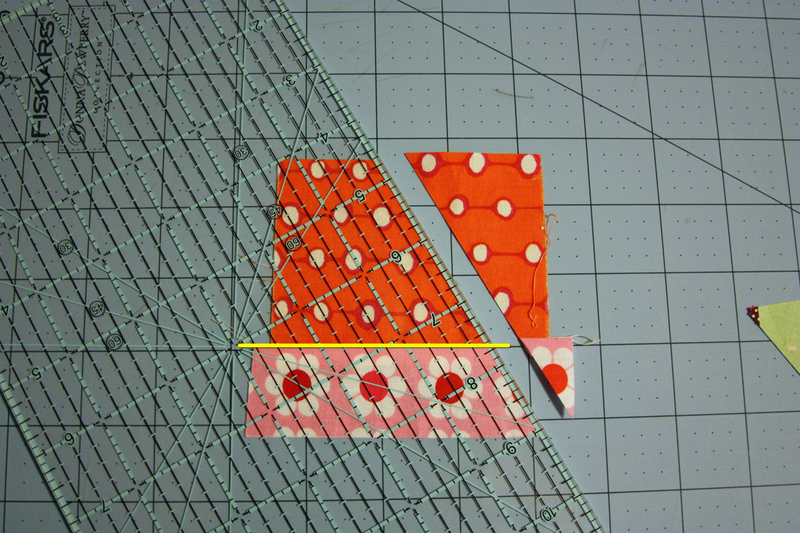 Place the 60-degree line of the ruler on the seam line, and the edge of the ruler at the bottom corner. Trim. Add a strip (green here). Trim the right. Rotate so the strip is on the bottom. Trim the other end of the strip. 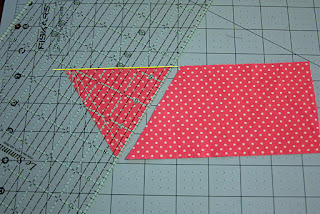 Sew a strip to the left side of the unit. Trim. Rotate so the strip is on the bottom. Trim. How we have two segments. But they're not quite the same size. No worries. Just decide which of the points on the largest triangle unit you'd like to sacrifice. I decided to sacrifice the green on the left since the strip is wider. 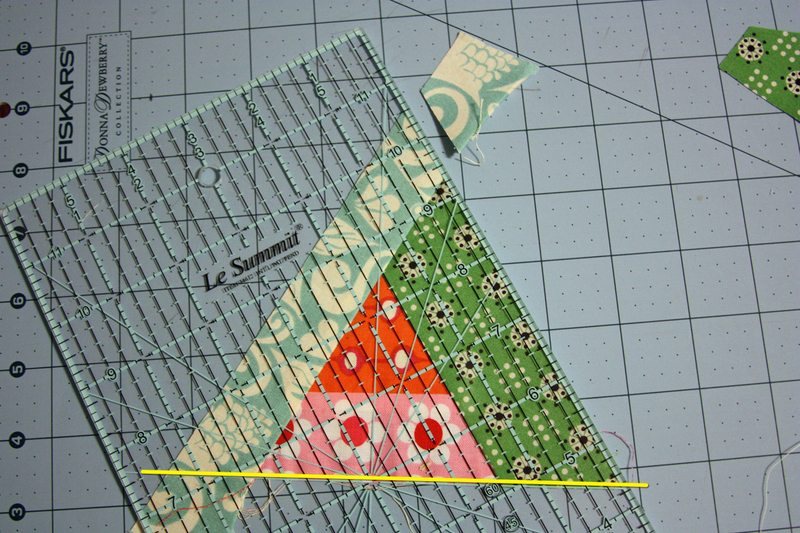 Sew the triangle units together, maching the bottom corners. You'll have excess fabric on the top. Trim off the excess. 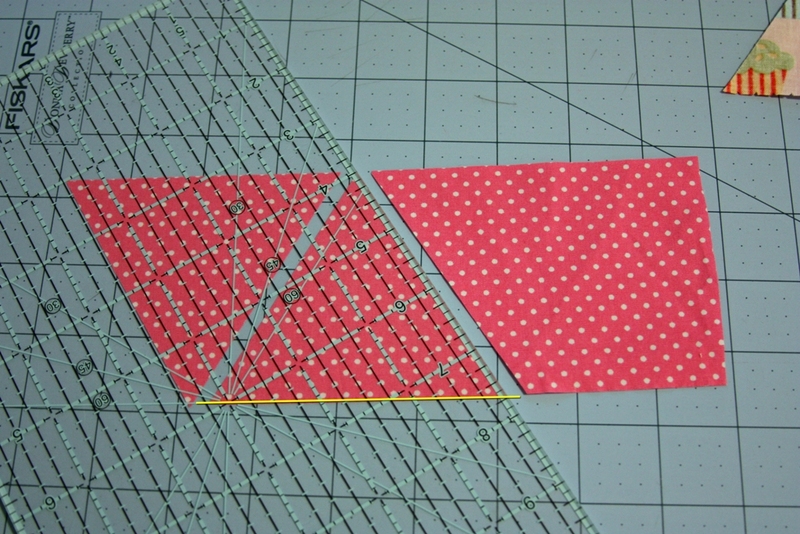 Now sew something big (a large strip or a large triangle) to the right side of the unit. Trim. To finish out the point, add a little piece of fabric. Trim. Rotate so the bottom of the unit is on the right. Trim. I had a 60-degree shape already cut, so I added it to the top. Trim the right side. Rotate, and trim the other side. To finish out the point, add a small chunk of fabric. Trim on the right. Rotate, and trim on the left. 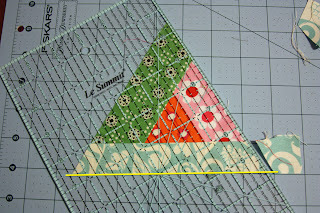 Now you have a finished triangle unit. Just keep making triangles and don't worry about the size. I'll be back later to show you some filler units and how to make it all fit together. 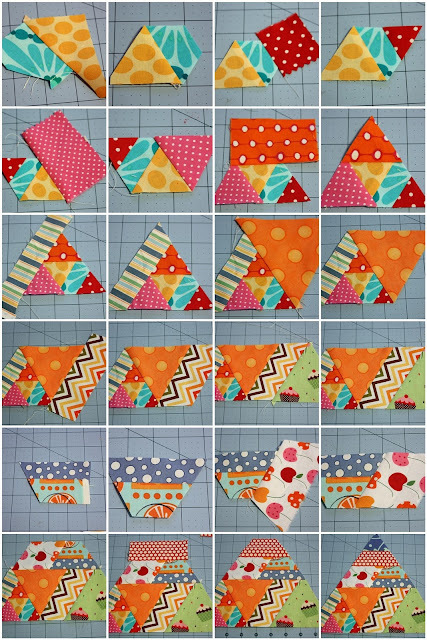 To keep from having to post another hundred pictures, I made a collage showing the progression of a different block. Maybe it will help to see it put together step by step. Pictures are shown before trimming and after trimming. Hope you'll give it a try. It's so much fun! I'll be back later with more. I love the look you get with this process. I'll need to try it. 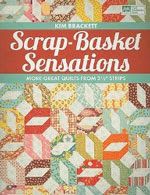 A great way to use up small scraps. It's like building blocks. Looks complicated but really it's not. I know doing a tutorial is a lot of work. You did a great job. 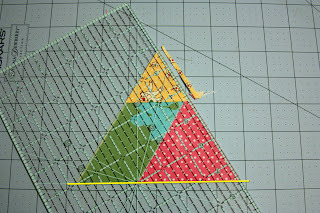 Really interesting method... and it's much more free than a traditional Pyramid quilt. This is fun and I hope to try it. Many thanks. Thank you for sharing this technique. I can't wait to try it. My *to do* list keeps getting bigger. Thank you for this great tutorial. 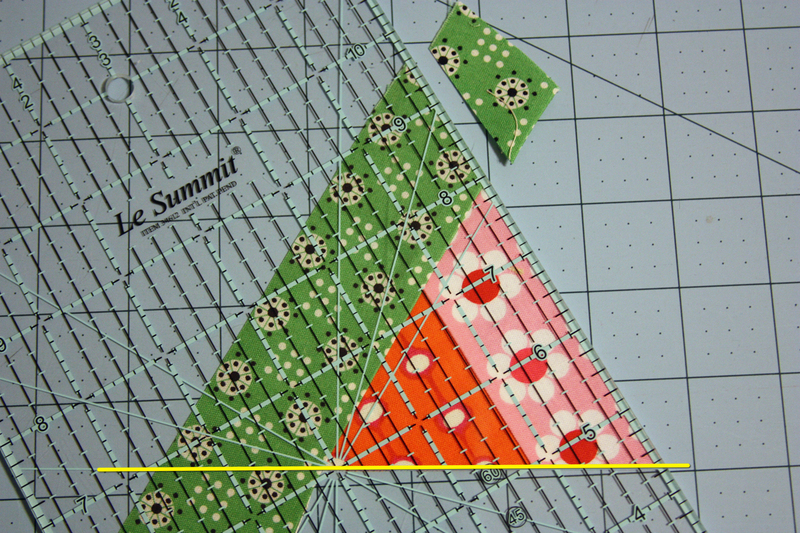 I'm working on another scrap quilt using 60degree diamonds. 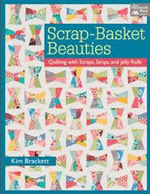 I love new ideas for using scraps and will definitely give this a try, Kim! Wow, this looks like it's going to be so much fun. I can't wait to try it. I'll have to link to you too! Fantastic tutorial! Thank you! Can't wait to try this. 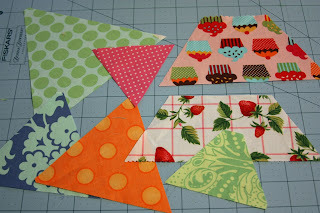 I have plenty of scraps to start with :-). 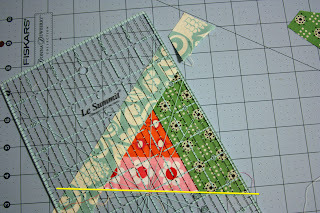 Wonderful tutorial but it sure looks complicated to me...the quilt is amazing! You explained it really well but it looks time consuming. Thanks for sharing so many pictures. 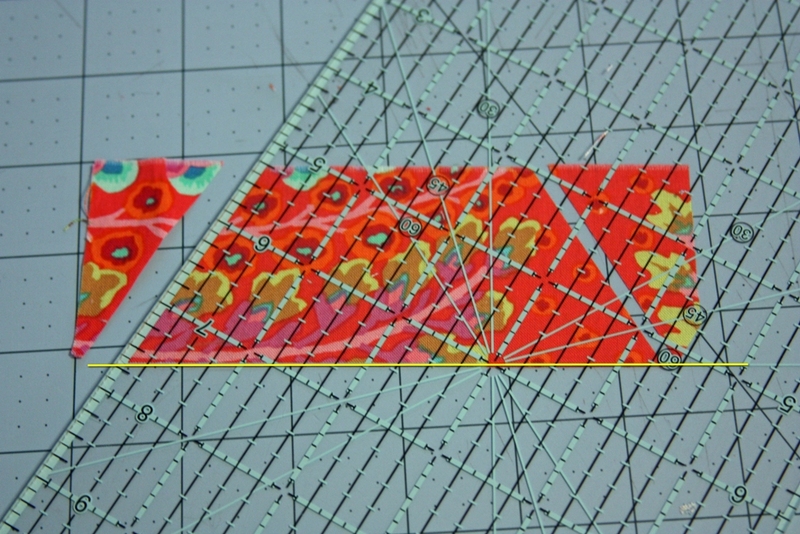 I am a visual learner, so I'll be happily following all the illustrations as I cut and sew. Looking forward to playing with this technique! Oh THAT is too cool! 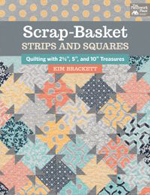 I cannot wait to try it...I have been looking for a piecing project to take to retreat in Jan...this looks perfect! 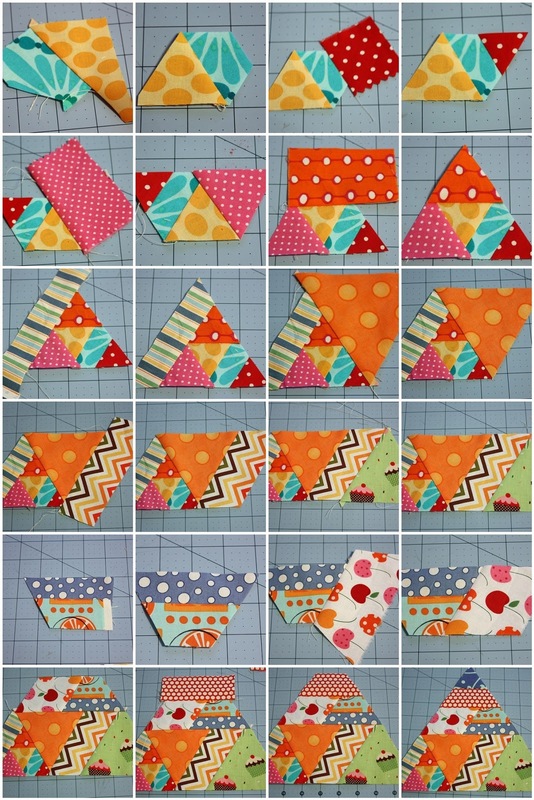 Thanks for sharing the tutorial on how to make these triangles. Very Neat! This is fascinating, Kim! Love the process and the finished product....thanks so much for sharing this....looking forward to part 2! Very Cool -- and FUN! I love all the fabrics you've chosen -- maybe I should have you choose my fabrics -- I don't think I could do it justice! 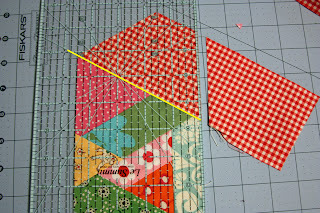 Love this concept...great way to get rid of pile of scraps that I have. I do have a question...how big is each segment? Thank you for that fabulous tutorial! Really fun quilt! 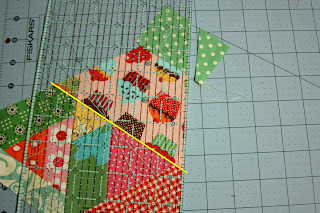 Excellent tutorial and what a fun quilt! I must try this method! I love how your brain works!!! 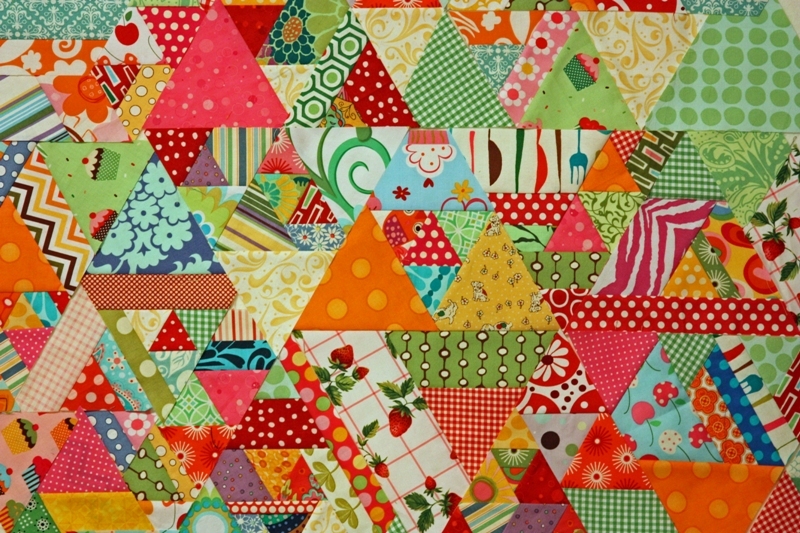 When the photo of this quilt popped up I was instantly smitten!! I certainly didn't know there would be a tutorial to follow!! Excitement! 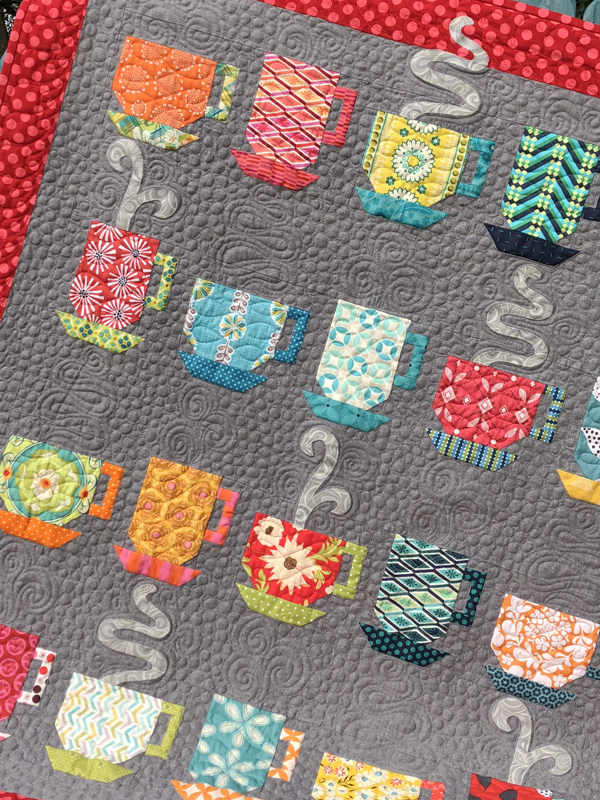 I love, love, love this quilt!!! Thanks so much for the wonderful tutorial!! I am definitely pinning this one! This is such a great tutorial!! 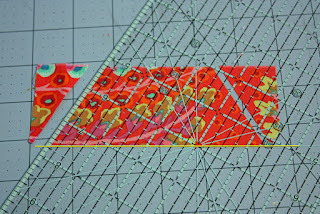 And such a great design process for an amazing quilt! I just got a 60 degree triangle ruler. This would be fun to try with it! 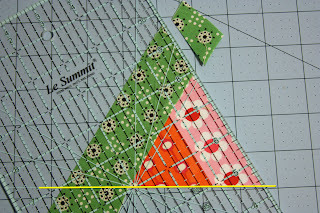 Love the process and the finished product....And such a great design process for an amazing quilt!Thanks so much for sharing this....looking forward to part 2! This looks simple but very interesting, I surely will try this. guild here in S. Alabama. How can I contact you? 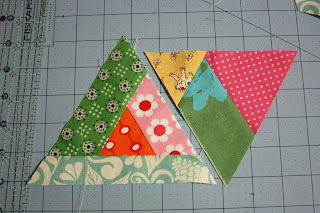 I really love the look of these triangles. What a great block! 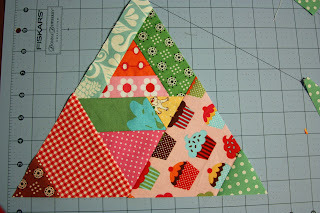 Love this-and I love triangles! Thanks for the great photos and instructions. This is going into my file to do...quickly! Oh, I didn't see your "Link to This Post" at the bottom of comments until it was too late. 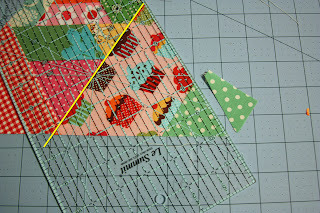 I've included your fantastic tutorial as part of my "Fabulous Friday Finds" on my blog, http://quilterinmotion.net, so I hope lots of people show up over there to see this fantastic tutorial. 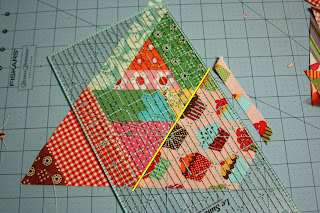 I just wish my scraps were as cute as all yours are! What a wonderful tutorial! I love that you use clear concise instruction with a little touch of humor. Bravo! What a fun tute. So easy to follow. I am going to start right now. I have a few! scraps. 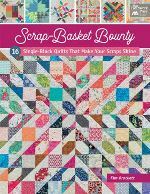 My sister-in-law has been wanting me to make her a scrappy quilt. 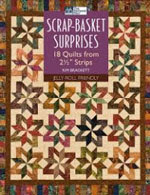 She even bought me a modern quilting book. 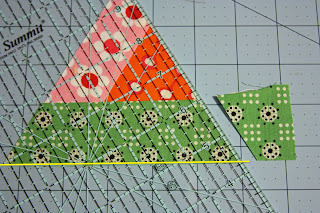 This tutorial makes scrap quilting seem easy. Thank you so much. Now I have the courage to start her quilt. 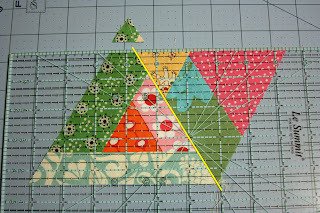 I have been doing a similar block for years for charity quilts only I make a paper pattern and keep a stash of paper triangles by my machine each time I cut off a piece of fabric I simply stitch it to the paper pieced pattern until the paper is full, I trim and stitch it so those already completed before I know it I have enough rows completed to make a complete and very colorful top.